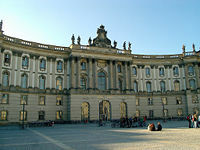 The Humboldt University of Berlin (German Humboldt-Universität zu Berlin) is a public university in Berlin, Germany. 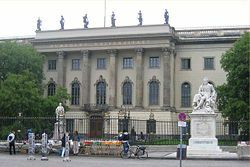 It is Berlin's oldest university, founded in 1810 as the University of Berlin (Universität zu Berlin). Based on Enlightenment ideals of an all-round education and the critical research to discover truth, the university pioneered the research intensive model of university that served as the model for modern universities throughout the western world. Its model of theological education, incorporating both the theoretical, critical research and professional education for ministry, has also been influential as an alternative to the classical tradition of character formation. Also, its core value of academic freedom, namely the freedom to learn and the freedom to teach, pioneered the liberation of university education from religious or government control. Despite serious threats to its standards of academic excellence by the Nazi regime and Soviet Communism, the university survived. Following the re-unification of Germany, it has restructured and has succeeded in attracting outstanding scholars and students both from within Germany and from around the world. It has been host to many famous intellectuals throughout its history, including no less than 29 Nobel Prize winners. Located in the beautiful city of Berlin, and maintaining high academic standards, the University of Berlin remains an attractive and influential institution for academic study. Nevertheless, while the University of Berlin has established an excellent approach to the mastery of intellectual skills and knowledge, without moral character and the ability to love our fellow human beings, such skills and knowledge can be used for the destruction of human life and the earth. For the University of Berlin to succeed in attaining its goals of educational reform, social responsibility, and global cultural awareness the education of the inner person is also important. The liberal Prussian educational reformer and linguist Wilhelm von Humboldt founded the university in 1810. The model on which he based the institution has become a standard for many other European and western universities. Humboldt was a proponent of the idea of free, universal education and implemented this principle within the university. Humboldt also insisted on the university being given land in order to make it independent of the Prussian government. This was a precursor to the concept of academic freedom. This concept of freedom of teaching (Lehrfreiheit) grants professors the freedom to teach the subjects they wish to teach and research the subjects they wish to research. The structure of German research intensive universities has served as a model for institutions like Harvard, Duke, and Cornell, among others, in the United States. This model places emphasis on the research work performed by professors rather than their teaching work, which contemporary critics say is undervalued. The model of theological education established at the university, based on the views of Friedrich Schleiermacher, has also proved successful and influential. Treating theological education as professional education coupled with research into the history and philosophy of ministry and theology, the program prepares ministers who have both professional competence and theoretical knowledge. This approach is greatly different from the education of character, or paideia, that lies at the heart of classical Greek education, and the tension between these two models has long been experienced in American theological education. The university's mission currently accentuates research, educational reform, social responsibility, and global cultural awareness. Humboldt University of Berlin was founded in 1810 by Wilhelm von Humboldt. Humboldt's vision was to create a "Universitas litterarum" providing an all-around humanist, Enlightenment-based education. At its founding, the university had four faculties: law, medicine, philosophy, and theology. The University was greatly influenced by the philosophy of Friedrich Schleiermacher who held a chair in theology from the school's founding until his death. Schleiermacher helped to define theology as a branch of study independent of philosophy and to solidify its importance, along with other liberal arts, in the university. Established as a "research university," with wissenschaft its defining goal, it was not self-evident that theology had any place in the new institution. Schleiermacher was instrumental in drawing up the founding document together with Humboldt and Johann Gottlieb Fichte who served as dean of the philosophical faculty and first vice chancellor. A single program was established, leading to the doctorate, the most advanced research degree, as the goal of the university was to do research and to teach students how to do research. The ultimate goal was thus the mastery of truth about the subject of study. Theology, however, is based on revelation, which by its very nature is not amenable to the disciplined, orderly, critical inquiry that is defined by wissenschaft. Furthermore, the institution held as its central mottos "freedom to learn" (lernfreiheit) and "freedom to teach" (lehrfreiheit). This core value of academic freedom ran counter to theology's traditional position as the ultimate censor of what could be taught and learned. Schleiermacher's proposal placed theological education in a different category: professional education, which he argued was for the benefit of society through the training of ministers to serve the religious needs of the people. He noted that the inclusion of a research agenda into the philosophical and historical aspects of theology would provide a valuable cognitive and theoretical foundation for the practice of ministry. This model of theological education, very different from the tradition paideia (character formation) derived from the culture of ancient Greece, proved highly successful. Partly due to the influence of the natural scientist Alexander von Humboldt, brother of Wilhelm, the University pioneered the introduction of many new disciplines. The university steadily grew throughout the nineteenth centuries, due in part to donations by the Prussian king Friedrich Wilhelm III. 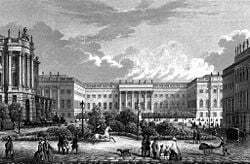 From 1828 it was known as the Frederick William University (Friedrich-Wilhelms-Universität), later also as the Universität unter den Linden. In 1949, it changed its name to Humboldt-Universität in honor of its founder. The University was considered part of the golden age of mathematics in the second half of the nineteenth century. It was in this period that mathematics was deliberately separated from the physical sciences. 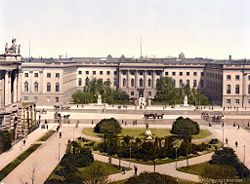 After 1933, the Humboldt University was, like all German universities, transformed into a Nazi educational institution. It was from the University's library that some 20,000 books by "degenerates" and opponents of the regime were taken to be burned on May 10 of that year in the Opernplatz (now the Bebelplatz) for a demonstration protected by the Sturmabteilung (SA) that also featured a speech by Joseph Goebbels. A monument to this can now be found in the center of the square, consisting of a glass panel opening onto an underground white room with empty shelf space for 20,000 volumes and a plaque, bearing an epigraph from an 1820 work by Heinrich Heine: Das war ein Vorspiel nur, dort wo man Bücher verbrennt, verbrennt man am Ende auch Menschen ("That was only a prelude; where they burn books, they ultimately burn people"). At that time, Jewish students and scholars and political opponents of Nazis were ejected from the university and often deported. In 1946, after the end of World War II, the university opened again. Located in the section of the city under Soviet control, the Communist administration soon took over control of the university. The political turmoil and the protest of students and professors against this Communist influence led to a division among the staff and students. As a reaction, the Free University of Berlin was founded in 1948 in the Western part of the city. During this period, the university was forced to develop in a way that ran counter to its former academic traditions and changed the academic content, study procedures, and research conditions in obedience to the ruling ideology. Until the collapse of the East German regime in 1989, Humboldt University remained under tight ideological control of the Sozialistische Einheitspartei Deutschlands (Socialist Unity Party of Germany), or SED, which, by rigorously selecting students according to their conformity to the party line, made sure that no democratic opposition could grow on its university campuses. Its Communist-selected students and scholars did not participate in the East German democratic civil rights movements of 1989 to a considerable degree, and elected the controversial SED member and former Stasi spy Heinrich Fink as the Director of the University in 1990. After the end of communism, the university was radically restructured and all professors had to re-apply for their professorships. The faculty was largely replaced with West German professors, among them renowned scholars such as art historian Horst Bredekamp and historian Heinrich August Winkler. Today, the Humboldt University is a state university with a high number of students (37,145 in 2003, among them more than 4,662 foreign students) after the model of West German universities, and like its counterpart Free University of Berlin. The main building is located in the center of Berlin at the boulevard Unter den Linden. The building was erected by Prince Heinrich of Prussia. Most institutes are located in the center around the main building. The Berlin-Adlershof campus opened in 2003, and houses the institutes for mathematics and natural sciences. 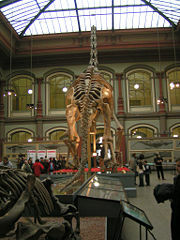 The university is host to a number of museums and collections including The Museum of Natural History at Humboldt-Universität. This is the largest natural history museum in Germany. Also associated with Humboldt University of Berlin is The Pathoanatomical Display Collection, a part of the Museum of Medical History. Other notable facilities include The Mori Ogai Memorial—dedicated to the Japanese doctor Mori Ogai for the purpose of spreading Japanese culture in Germany, The Little Humboldt Gallery—a place in which local artists' work is displayed, and The Arboretum—a 3.5 hectare home to more than 1200 species of trees and shrubs. There is also the Central Institute which includes the Language Centre, Library, Computer and Media Service, and Sport and Recreation facilities. Like many major public universities in Europe, all of Humboldt University students commute to the school. This is one area in which many European universities differ greatly from their American counterparts, at which the majority of students live on campus. For Humboldt, this means student life does not have any central focus, allowing students to take full advantage of the cosmopolitan city of Berlin. The student population is greatly augmented by international students studying abroad in Germany. In 2007; 4,493, or 15 percent, of 28,368 students were from abroad. This high percentage is evidence both of the draw of the city of Berlin and the school itself. 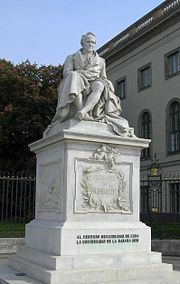 Statue of Alexander von Humboldt outside Humboldt University. Note the Spanish inscription describing him as "the second discoverer of Cuba." The university has been home to many of Germany's greatest thinkers of the past two centuries, among them philosophers Johann Gottlieb Fichte, G.W.F. Hegel, Arthur Schopenhauer, and Friedrich Schelling, theologian Friedrich Schleiermacher, legal theorist Savigny, philosophers and famous physicists Albert Einstein and Max Planck. Founders of Marxist theory Karl Marx and Friedrich Engels attended the university, as did poet Heinrich Heine, German unifier Otto von Bismarck, Communist Party of Germany founder Karl Liebknecht, as well as notable scholars and activists W. E. B. Du Bois and Robert Schuman. The surgeon Johann Friedrich Dieffenbach also worked at the university in the early half of the 1800s. Twenty-nine Nobel Prize winners have been associated with the university. These include Jacobus Henricus van't Hoff (chemistry), Theodor Mommsen (literature), Walter Nernst (chemistry), Max von Laue (physics), Gustav Hertz (physics), James Franck (physics), Emil von Behring (medicine), and Robert Koch (medicine). ↑ Wilhelm Humboldt Stanford Encyclopedia of Philosophy. Retrieved June 19, 2007. ↑ Why universities aren't working ExpressNews. Retrieved June 19, 2007. ↑ David H. Kelsey, Between Athens and Berlin (Grand Rapids, MI: Eerdmans Publishing Company, 1992, ISBN 0802806724). ↑ Mission Statement Humboldt University of Berlin. Retrieved June 19, 2007. ↑ Short History Humboldt University of Berlin. Retrieved July 9, 2007. ↑ Heinrich Begehr (ed. ), Mathematics in Berlin (Birkhauser, 1998, ISBN 3764359439). ↑ Horst Heidtmann, "Book Burning," in Encyclopedia of the Third Reich (New York: MacMillan, 1991). ↑ Facts and Figures Humboldt University of Berlin. Retrieved July 9, 2007. History of "Humboldt University of Berlin"
This page was last modified on 20 January 2018, at 00:09.